Two of the state's largest hospitals are hoping to combine forces in a new healthcare network. 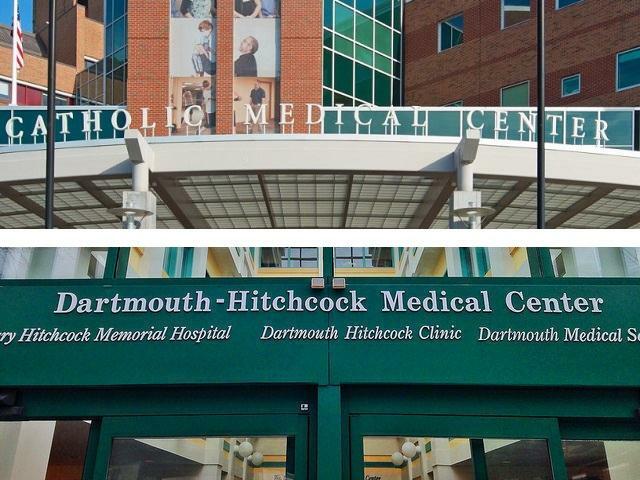 Dartmouth-Hitchcock and GraniteOne Health, an existing group that includes Catholic Medical Center, signed a letter of intent Thursday to combine under a new entity called Dartmouth-Hitchcock Health GraniteOne. Dartmouth-Hitchcock CEO Joanne Conroy says the deal is meant to give the group more opportunities to expand, including with new in-patient beds and more staff. She says right now Dartmouth-Hitchcock is overwhelmed by the demand for hospital transfers. Catholic Medical Center CEO Joseph Pepe says the deal will better position both hospitals to increase services for rural patients. Both sides hope to wrap up the deal by the middle of next year, though that will depend on winning approval from state and federal regulators.